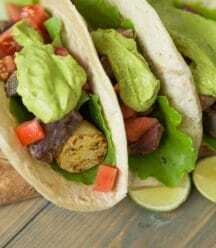 A healthy and delicious oil-free roasted potato taco with a creamy and bright Avocado Lime Sauce from Great Vegan BBQ Without A Grill. Bake for 8 to 10 minutes, then toss the potatoes and bake again for 8 to 10 minutes, or until nicely browned and crispy. Remove the pit from the avocado and scoop the flesh into a blender. Add the yogurt, lime juice, cilantro, garlic and sea salt and blend on a high speed until it’s smooth and creamy, approximately 1 minute. Eat immediately (see note). This sauce is best when eaten the same day that it's made. Because it's made with avocado it will turn brown the longer it's stored.